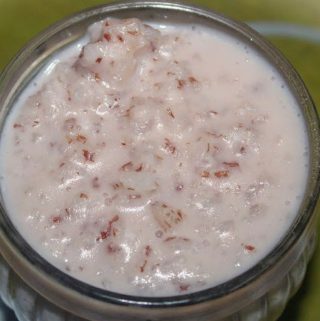 Pal payasam Kerala style recipe (also spelled as paal payasam recipe) or brown rice pudding recipe using Kerala rice and milk is popularly known as unakkalari paal payasam in South India where unakkalari is a special kind of broken brown rice and paal payasam means milk based kheer or pudding. This pal paysam resembles the famous the ambalapuzha payasam (pal payasam made in ambalapuzha temple) in taste though this is definitely not the same recipe. Rice pudding is a very special and commonly found dessert in Indian celebrations including weddings, festivals and also the usual traditional family gatherings. This Kerala style pal payasam made using traditional Kerala style broken brown rice makes a very yummy and easy payasam or dessert for Kerala Onam sadya (traditional Kerala style feast for Onam festival). Creamy white rice pudding in pressure cooker or creamy rice pudding recipe in a pan, both recipes using sweetened condensed milk, will help you make easy and yummy white rice puddings for desserts. Here I used the slightly pink color broken brown rice known as unakkalari or rose matta rice which is popular in South India, but if this is not available you can also try regular brown rice. The Kerala rice which is the broken brown rice adds a nice rose colored hint to the payasam or kheer. If you wish to try broken brown rice for pudding, as called in the recipe, you may try this broken brown rice or the Kerala style broken brown rice to make this rice payasam or pudding. 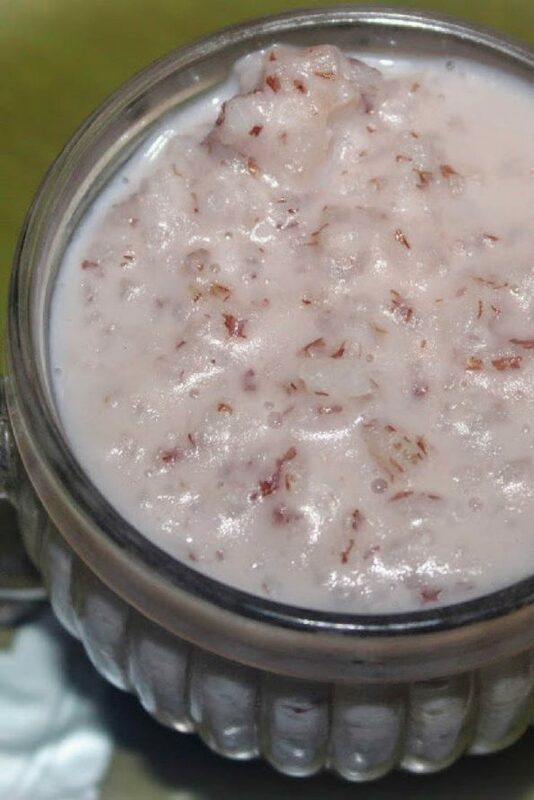 This paal payasam or rice kheer which is actually the Indian rice pudding is a delicacy loved by both children and elders in the family and most importantly it is one of the most traditional desserts in India. Rice pudding is prepared using rice, along with whole milk and few other ingredients including spices like cardamom and saffron. It is very rich in flavor and you can easily prepare it in the traditional way or using a pressure cooker. In this recipe for Kerala style brown rice payasam or pudding, we use only cardamom to flavor the dessert. Brown rice pudding is a favorite of mine and it goes very well as a dessert for celebrations and also you can enjoy this as a simple every dessert with lunch or dinner. In the traditional Indian method, people used to prepare the pudding or kheer using large pans where you need to stir the pan frequently to make sure the bottom of the pan is not getting burnt. You can also use a non stick pot or large kadai or pan to make the payasam, but using a pressure cooker is the easiest and most convenient method where you have to do very less work and get the recipe done really fast! You basically cook the rice with half of milk and water until almost the rice is cooked and then simmer the cooked rice to perfection with the remaining milk and water, until the rice is cooked and soft and blended nicely to make the most delicious and yummy pal payasam or rice pudding. The addition of cardamom powder really adds much flavor to this brown rice payasam or brown rice pudding. So here is how you can make this easy, simple and absolutely delicious brown rice pudding following this pressure cooker recipe for brown rice pudding or pal payasam Kerala style recipe. 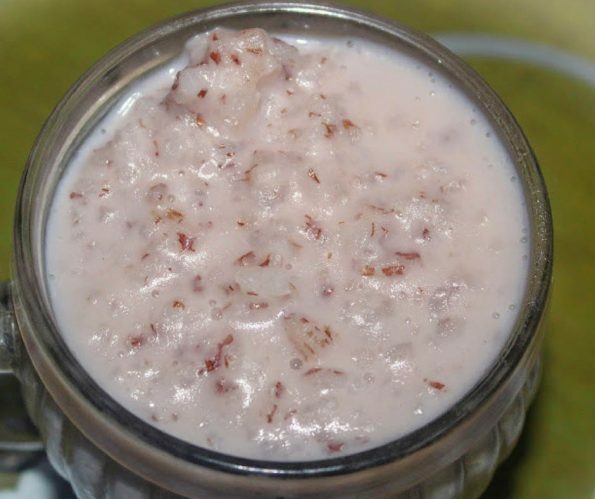 South Indian Kerala style pal payasam or rice pudding made using broken brown rice, milk and sugar is very delicious and makes a great dessert for dinner or any celebrations or festival feast like Kerala Onam sadya. Wash the rice and transfer it to a large sized pressure cooker (a 5 liter pressure cooker will be good, if you use small pressure cookers you run the risk of hot milk boiling over and becoming messy). Mix the whole milk with water to make a diluted milk mixture and add half of the diluted milk mixture to the rice. Add the sugar and cardamom powder to the pressure cooker, stir to mix all the ingredients. Close the pressure cooker with the lid and safety valve and cook in medium heat for about 3 to 4 whistles or about 8 to 10 minutes. I used the Kerala unakkalari rice (kind of brown rice) for preparing the kheer/pudding, but if you are using regular brown rice the cooking time may differ and you may need to cook for little more time or adjust the cooking time accordingly. Switch off the stove and wait for the pressure cooker to cool down. Once the pressure cooker is cooled enough, open the cooker and see if the rice is almost cooked. Add the remaining half of diluted milk mixture and simmer in low heat for another few more minutes until the rice is cooked completely and very soft in texture and blended nicely with all the ingredients to forma delicious and creamy rice pudding or payasam. Serve the payasam or pudding hot or at room temperature of you can store in the refrigerator for few hours and serve chilled if you wish! 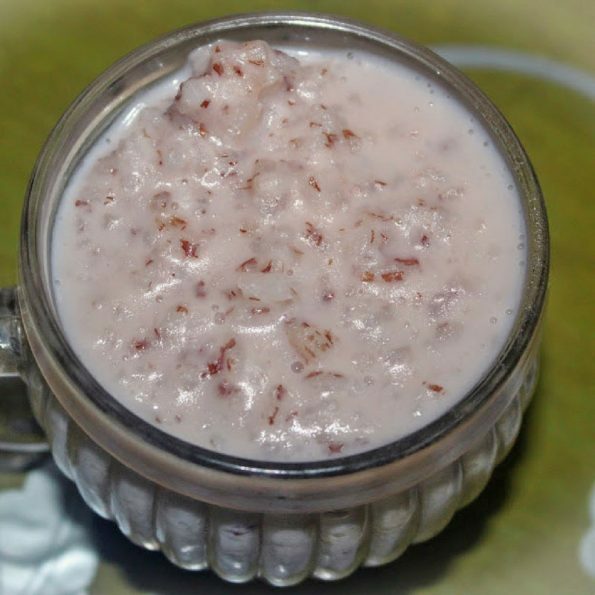 Traditionally the brown rice pudding or rice pal payasam is served just as it is without any extra toppings, and it is really very very delicious on its own. If you wish to add any toppings, you may add slivered almonds or pistachios or you can fry a few raisins and cashews in little ghee and garnish the rice pudding with the ghee fried cashews and raisins. As I already mentioned earlier, I used the popular broken brown rice known as unakkalari or rose matta rice which is popular in Kerala. If this is not available you may use other kinds of broken brown rice or homemade broken brown rice (from regular brown rice) but with different kinds of rice, the cooking time for the dish can change and also the consistency and texture may change. So I highly recommend using the same Kerala matta rice or unakkalri rice for the perfect texture and taste and also for the natural light pink color that you see in this delicious dish. Make sure to use a large sized pressure cooker (I used the 5 liter pressure cooker) to avoid the risk of milk boiling over. Hope you found this post on pal payasam Kerala style recipe helpful in making yummy brown rice payasam or creamy brown rice pudding in pressure cooker.